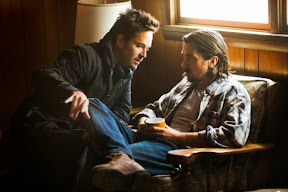 “Let me make this right,” is more than just a line uttered by one of the main characters near the end of writer/director Scott Cooper’s feature filmmaking follow-up to Crazy Heart. 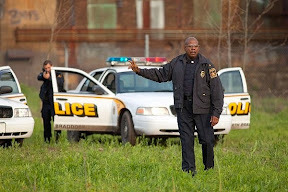 When it comes to the core ensemble of individuals that populate the unforgiving terrain of a blue collar coal town in Pennsylvania, the desire to make things right is more than just something to say – in Out of the Furnace it’s a way of life. Filled with men who long to right wrongs, regardless of the cost – what the characters onscreen realize far too late is that even if they have the best of intentions, sometimes scores simply cannot be settled since every single person has a slightly different definition of right and wrong in this gritty, existentially driven revenge picture. Bogged down by wrongs right from the start following the film’s horrific introduction to Furnace’s embodiment of pure evil as played by Woody Harrelson as the unmercifully twisted, sadistic Harlan DeGroat, we encounter a pair of brothers whose lives will be forever changed once they cross his path. With the deck stacked against them right from the start, it isn't too long before we realize that although they're related, we've been introduced to two very different brothers with two very different ways of coping with the hands they’ve been dealt. 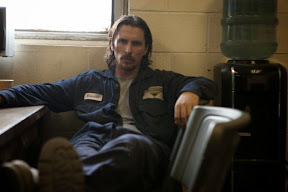 The older of the two, Russell Baze (Christian Bale) keeps his head down and shovels coal in the very same factory that put their father on his death bed. Willing to risk the same fate (before he realizes, the plant is inevitably closed in favor of cheaper foreign labor) in order to put food on the table and pay his bills, Russell has unofficially taken over his father’s role as the family patriarch as the dutiful, good son. 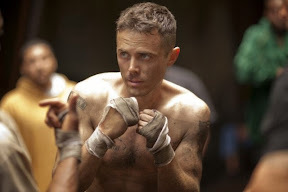 Unwilling to do the same, his restless younger brother Rodney (scene-stealer Casey Affleck) took the first opportunity he could to get out of the dead-end town. Enlisting in the military and stop-lossed into a total of four tours before he finally returns home to stay, Rodney has tried everything to sublimate the pain and reproduce the primal adrenaline rush of battle. 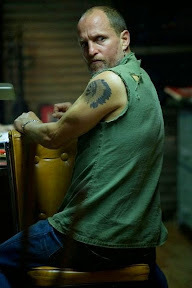 But when gambling only leads to debt (which in the past Russell worked double shifts to keep at bay without informing his prideful, troubled brother), before long Rodney begins taking part in underground fights as an agreement with his money man John Petty (Willem Dafoe). Tired of the minimal paydays, Rodney forces John to arrange a higher stakes match in order to resolve the outstanding debt once and for all that he not only owes John but John in turn owes to Harlan, which leads to a fateful meet that has a domino effect on every member of the ensemble cast in unimaginable ways. And it’s this key decision that winds up forcing Russell out of his daily grind, leaving him no choice but to put down the shovel and pick up a rifle to fight the war that has been waged in his own backyard. 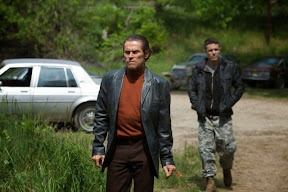 Incredibly downbeat and emotionally exhausting, although Cooper’s take of brotherly vengeance was initially planned as a vehicle for actor Leonardo DiCaprio and his Body of Lies director Ridley Scott (both of whom still serve as producers), it’s hard to imagine anyone other than Bale in the role, given the way he once again manages to disappear completely into the role. 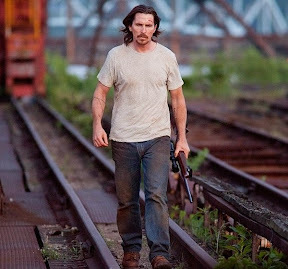 Filled with character actors as opposed to A-listers that stand out too conspicuously as DiCaprio may have done (through no fault of his own given the way it’s hard to forget who you’re watching in a number of his films), Out of the Furnace is therefore helped by the lack of obvious megawatt star quality. 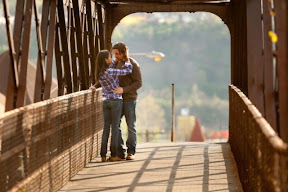 Likewise, since the work owes a great deal to its ambient surroundings which help convey mood and atmosphere, the Pennsylvania town becomes a character in its own right. While the main theme of the film as well as the arc for our lead character is incredibly straightforward, Furnace makes one fatal mistake along the way by working one too many dubious contrivances into the film’s plotline that call attention to themselves amid the simplicity. From a cell phone call that transforms into a digital recording at the exact right moment in order to capture audio of a murder and a few too many cruel twists of fate that intersect at the exact same time for Russell with regard to his brother, his girl etc. (that seem better suited to a bad country song), when Furnace tries to get too complex, it loses its way completely. And with so much affecting Russell, you begin realizing that plot might have been strengthened considerably by sharing some of the wealth of the storyline among the rest of the cast to build up the back-stories and characters played by Zoe Saldana and Forest Whitaker in particular in order to adequately pay off on a narrative revelation that is revealed in the film’s second half. These shortcomings aside, overall Cooper proves to have an even greater cinematic handle on filmmaking his second time around and uses the various resources at his disposal to rich effect. By calling on multiple senses at once, this technique particularly stands out via a symbolic hunting sequence that is echoed in the movie’s penultimate sequence. From the effective use of Pearl Jam tunes and Dickon Hinchliffe’s understated score to help punctuate the mood of vital moments to a terrific visualization of the darkness of the color palette (which is virtually free of bright colors) to transport you to the setting, Cooper does an admirable job of externalizing the internal struggle of the characters through the cinematic medium. It’s these smart, subtle touches that stand out even more in Fox’s flawless Blu-ray transfer. 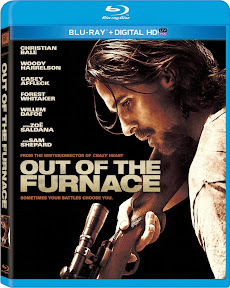 A deceptively simple tale of vengeance, in Out of the Furnace, Cooper weaves a multi-layered tapestry that reinforces at every turn his characters’ desire to try to make things right, even if they risk getting burned in the process.